EGA Products 6 Step Steel Industrial Stairways, 49" Landing Height (rise), 1000 lb. Weight Capacity, Gray enamel paint finish. 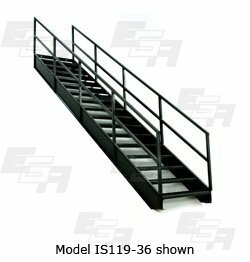 EGA Products 6 Step Industrial Steel Stairways offer the industries most reliable industrial stairway for use with mezzanines or elevated platforms. With a 36.4 degree climb angle, 36" wide steps and handrails made from 1 1/2" round tubing this stairway is comfortable and extremely safe to climb.